We invite you to experience Amarillos full service hotel, Holiday Inn Amarillo West Medical Center. Conveniently located in the heart of Amarillo, we offer the best in service and amenities to surpass all of your expectations. We feature over 151 well-appointed guest rooms which will allow for a relaxing and enjoyable stay while in the panhandle region. We are only a short distance from Amarillos major attractions including: the Big Texan Steak Ranch, The Cadillac Ranch, Palo Duro Canyon State Park (USA's 2nd largest canyon) and Wonderland Amusement Park. The hotel is only minutes away from major area corporations as Textron, Tyson Foods, Pantex, Owens Corning, GE and Grifols. Our hotel features our Flame restaurant and offers a variety of selections to satisfy all. You can enjoy hosting your meetings, reunions, or special events on-site featuring over 3600 sq. ft. of banquet and event space. Our hotel offers relaxing rooms featuring stylish decor & amenities, including a micro/fridge, wired/wireless Internet, 37 HDTV and an iPod dock. 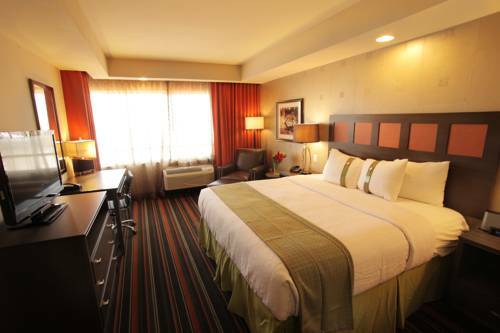 Relax, unwind and stay at the Holiday Inn Amarillo West medical Center! Trailblazer: 1050 sq. ft room with high ceilings, elegant decor, chandaliers. Equipped with a VGA Projector with 9'x12' screen. XLR sound connections with IPOD and VGA Connections for computer/displays. Wireless/wired internet is available. Room is expandable. Pioneer: 1050 sq. ft room with high ceilings, elegant decor, chandaliers. Equipped with a VGA Projector with 9'x12' screen. XLR sound connections with IPOD and VGA Connections for computer/displays. Wireless/wired internet is available. Room is expandable. West Gate MallLocal Mall offering shops of all varieties with anchor stores: Dillards, JC Penny, Bealls, Sears. Food Court located inside the mall. Discount Movie Theater offering $1.50 movies upon availablity. Mall is located within a 1/2 mile of the hotel. Splash Amarillo WaterparkThe Texas Panhandle's largest water park. Loaded with different waterslides, refreshments, and family picnic fun. Splash Amarillo is open in the summer season. American Quarter Horse Association (AQHA) MuseumAQHA National Headquarters is located in Amarillo, Texas. The AQHA museum is located in the adjacent building and truly exemplifies the livelihoods of the American Quarter Horse. Big Texan Steak RanchHome of the famous 72 oz. steak. You get this steak for free if eaten in one hour or less. There always seems to be somebody trying it and there is a great Texas gift shop attached. Kwahadi Indian Heritage MuseumA museum dedicated to the American Indian. A great place for historic artifacts and information. Texas The Music DramaThis musical drama is summer seasonal and located right in the Palo Duro Canyon State Park. It is played nightly. Amarillo Botanical GardensLocated in the Medical Park of Amarillo. The Botanical Gardens have a variety of local and exotic plants and flowers. Open year long. Panhandle Plains MuseumOne of the top museums in the state ot Texas. This museum is well rounded with Texas history, dinosaur fossils, American Indians, War artifacts and other interesting things that is fun for the whole family. Westgate MallAmarillo's largest mall with anchor stores of Dillards, JC Penneys, Bealls, and Sears. This mall is over a mile long and located right next to the hotel. Don Harrington Discovery CenterOne of Amarillo's unique scientific attractions. Home of the world Helium monument. Great scientific games, puzzles, and attractions for the whole family. Also has a planetarium. Amarillo Convention CenterAmarillo's Convention and Civic Center. The local place for concerts, tradeshows, antique shows, gun shows, craft shows, conventions, and local sports.